Smartphones and social media have a symbiotic relationship, with both feeding off each other. The latest Social Monitor finds out which brands are making the most of the link. This year is predicted to be the year of mobile in marketing, and for once, the prediction will probably come true. Sales of smartphones accelerated last year, meaning they now account for more than half of mobiles in the UK. Interaction with social media has been one of the great drivers of mobile internet use. In order to assess how socially adept handset brands are, social media specialist Yomego carried out research into the top 10 bestselling mobile handsets. One of the first things that is apparent is the very high level of satisfaction across the board for all models surveyed. All registered above 70/100 on this metric. Mobile handsets have become almost like cars in the sort of brand identification that they elicit from users. Owners are also incredibly passionate about their phones, as evidenced by the number of fan pages. Forums and message boards also perform a valuable role in helping consumers get the most from their phones, troubleshoot any problems, and find out about new apps they can use. It is perhaps no surprise that the phone with the highest social media ranking (SMR) is the iPhone 4S. It is the top-selling model surveyed, and created more mentions than the other nine handsets combined - testament to Apple's brand supremacy. What is more surprising is that this is on the back of no official social involve-ment by the iPhone/Apple brand itself. The void is filled by fan sites and tweeters, and fans of other phones. The iPhone is the clear benchmark in the sector, with every other model receiving a high number of posts comparing it with the iPhone. A high number of authors have been suspended from Twitter because of the appeal of Apple products to spammers. This may partly explain Apple's reticence about getting involved in an area where it will struggle to exert close control. Other brands have been much more embracing of social channels. Nokia uses Facebook, YouTube, Twitter and Foursquare to engage with a global audience. 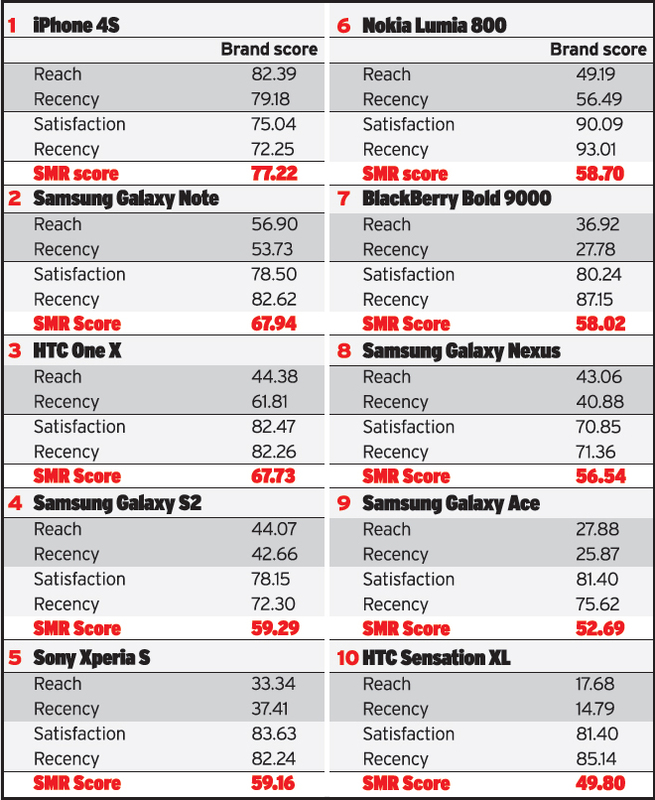 Nokia's Lumia 800 had the highest satisfaction rating of any brand, but its reach pulled its overall ranking down slightly. A projection mapping event featuring Deadmau5 DJing in front of Millbank Tower registered highly on social, but fell just outside the assessment period. HTC has put social at the heart of its latest marketing strategy, 'As Recommended By', which aims to harn-ess personal experiences and turn them into recommendations from real people. The first iteration of this approach is a multimedia campaign that features a photography student undertaking a fashion shoot and uploading the resulting images while skydiving. 'The campaign embraces real people's first-hand experiences of the HTC One smartphone and allows them to use social media to share their impressions with the world. The campaign will also drive engagement across other channels, including TV, retail and experiential,' he adds. The TV ad that kicked off the campaign received almost 900,000 views in the first two weeks on YouTube, although little conversation around the ad registered with Yomego's research. There will be a number of consumer engagement campaigns this year placing social at the brand's heart, says Atkins. Engagement through competitions really lit up social activity in the research. Sweepstakes, most notably 'retweet to win' competitions produced significant spikes in mentions. A competition for HTC One X through Play.com on 6 April generated 3370 retweets. With four handsets in the top 10, Samsung is a significant player in the handset market, and its Galaxy Note phone/tablet hybrid received the second highest SMR score. The phone is the centrepiece of the current Samsung Mobile Facebook page, which also features an interactive tab covering the main features of the phone, such as its 'smart stylus'. Samsung makes extensive use of its YouTube channel to showcase its phones and their abilities. There was a significant spike in conversation on 27 February when the first-look videos cropped up as the Note launched around the world. Positive conversation around the handset focused on its 'best of both worlds' claims, while influential coverage on sites such as Mashable, CNET and Gizmodo labelled it a 'phablet'. There was negative conversation around its large size and what some see as an identity crisis - is it a phone or a tablet? Twitter is the dominant social channel for handsets, accounting for more than 60% of mentions for the HTC One X, Nokia Lumia 800 and BlackBerry 9000. There is a mixture of approaches from the channel, from Apple's no official iPhone presence stance, to UK-specific Twitter feeds for BlackBerry, Nokia and Samsung. 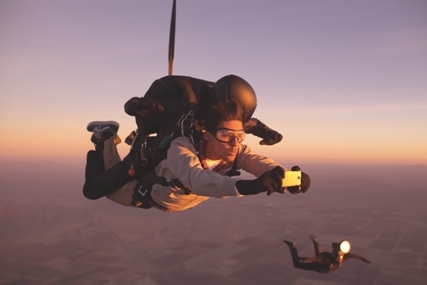 Sony is slightly unusual in having a Twitter account for its Xperia handset (@sonyxperiagb). This allows it to focus directly on customer service. Away from such official and non-official Twitter accounts, message boards and forums are a major contributor to the social buzz. For the BlackBerry 9000 they account for 26% of mentions, with spikes around the official launch of the mobile brand's new operating system on 6 January. Android forums are popular among all handsets using the operating system. Instagram's unveiling on Android created a spike for all Android handsets, underlining the appeal of certain apps. Nokia emerges from the research as one brand that clearly understands social. Criticism of battery life through social channels led to a battery update on 4 April. The company also launched a 'Where's my Update' site, which allows users around the world to find out when an update is available. Such responsiveness is a good idea, given the fact that mobile phone users have the power of communication in their hands and are increasingly likely to speak about their experiences online. But for now social responsiveness varies, presenting adept brands with an opportunity to steal a march on their competitors in this most wired of markets. Steve Richards (@chips11), MD of specialist social-media agency Yomego, suggests how mobile handset makers can maximise impact, engagement and advocacy in social-media activities. Share some love Some of the most-popular handset communities are created and curated by fans. These pages often have a big and engaged user base, and manufacturers could make the most of these ready-built communities by offering exclusive content, videos, new model handsets for review and early news of updates. Don't follow Apple Apple's approach to social media relies on unshakeable brand loyalty and an existing army of advocates. Other brands will need differentiated, reliable products and compelling content if they are to erode this market leadership. Brands that position themselves as facilitators tend to do well. Be brave This is one of the most competitive sectors we have scored. Challenger brands need to invest in content specifically designed for social channels. The best strategies consistently entertain audiences regardless of whether there's a new handset release or not. The relative ubiquity of mentions of a brand on social media, compared with sector rivals. Reach this month, relative to reach in the previous three. An aggregated sentiment score taken from Alterian SM2 and human analysis. Positivity/negativity, relative to reach in the previous three months. Averaged popularity score, out of 100. All scores measured 11 January10 April 2012.